This is a well-written and well thought out book about the subject of the alleged imminent return of Planet X. It portrays a terrifying vista of death, destruction and social breakdown; the direct result of increased solar activity as Planet X draws near. This is not a book for Granny as she sits by the fire on a chilly winter’s night! The three researchers who have co-written this book bring together a cohesive framework of material from diverse interest areas. There is plenty of scientific data to examine, plenty of cynical and edgy political debate to consider, plenty of gritty survivalist training to embark upon. It’s a strange mix, for sure: If you can imagine the high street guy with the sandwich board proclaiming that “the end of the world is nigh” then returning to his university day job to mark some undergraduate papers, before leaving for his karate class, then you have a sense of this book. Here’s the crux of what is presented by these catastrophist theorists: Planet X is on its way back and will carve a p ath through the solar system that causes the Sun to enter a stage of feverish activity. If the debris associated with Planet X’s ‘protoplantary disk’ doesn’t wreck enough havoc through meteorite bombardment, then the influx of deadly high-energy solar radiation and widespread EMP events will kill millions (billions?) and cripple the structure of the modern world. We in the West have forgotten how to look after ourselves when the trappings of modern industrialised society are suddenly pulled out from under our feet. So, unless we pull our socks up on an individual level to survive this coming maelstrom, then we and our loved ones are in serious, serious trouble. This scenario has something of the popular 50’s’B’-movie about it, not just in the gloomy ‘death from above’ scenario, but also in terms of how society responds, or rather fails to respond. The book cogently argues that the answers to survival are local ones. The authors acknowledge that disaster relief efforts in the past 20 years have improved immensely, yet they argue that the coming catastrophe is just so awesome in its magnitude that the whole system will effectively collapse, with those in power seeking refuge in arks and underground bases. The rest of us will be left to fend for ourselves in some kind of post-nuclear winter-like nightmare. And we simply won’t know what to do to save ourselves, because we’ve never had to deal with anything remotely like it in our lifetimes. It’s a bleak picture. I have to ask myself; have the authors sufficiently convinced me that this impending threat is real to take the kind of extreme precautions they recommend? So, do I dismiss this book out of hand? The answer is also no. Because the usefulness of this book goes well beyond the rather academic argument of the existence and location of Planet X. This book contains a wealth of fascinating and resourceful material which would stand us all in good stead should any major disaster strike. I know a bit about this, because this year my home city was flooded and we lost water for two weeks, and for a while electricity as well. On the day of the flood the surrounding area took on the look of a war-zone, with abandoned cars all over the place. People did exactly what this book predicts would happen; they headed for the safety of their homes. Had both water and electricity been lost for any length of time the whole county of half a million people would have been evacuated. For two weeks we lived on the edge, and normality returned very slowly indeed. It was a good time to take stock and realise just what we all take for granted these days, and how ill-prepared we are for disasters. While the world’s media buzzed us in their helicopters, and the bottom of our street appeared on the 24-hour news, what became quickly apparent locally was that people swung together and got on with it. I have a little more faith in the collective reasoning and resourcefulness of the community at large than the authors of this book, but that might reflect a social difference betweenBritain and the US, where the survivalist tracts in the book are mostly focussed upon. Given a choice between facing the apocalypse in either of these two nations, I would opt for Blighty every time! And this book has entrenched this opinion further. I would not entirely argue against the implications of the Mayan prophecy of the end of the Age in December 2012. Their cycles reek of astronomy. Quite how it’ll work is anyone’s guess, if at all. Solar activity, as argued by the authors, may be a realistic scenario to consider, although our atmosphere will take care of a lot of the heightened bombardment of rays, a fact omitted in the book. But the Sun might still perform some tricks and knock out various satellite platforms. Which would be a big problem for mobile phone users, TV addicts and the defence departments of major world governments, in that order of seriousness. But the Mayans were wrong about their own demise, remember. They failed to predict the collapse of their own nation, the sudden loss of their own civilisation. Their age came and went, and it had nothing to do with 2012 at all. So why is it relevant at all? 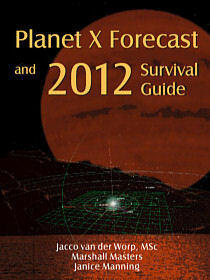 I suspect that ‘Planet X Forecast and 2012 Survival Guide’ is a well-meaning attempt to issue what the media constantly describes as a ‘wake-up call’. There is an attempt here to galvanise a community of like-minded thinkers into action, and the meaning behind it is honest and, indeed, earnest. If I think that is mistaken it is only because I hold an opposing set of views. If I believed what the authors of this book believed, then I’d be out there doing exactly the same as them. Trying to save whatever part of the world is salvageable from the wreck of Planet X return. But, the world isn’t listening anyhow. It can’t even cope with the more likely scenario posed by Global Warming, which is less of a cardiac arrest scenario so much as a lingering death from metastasizing cancer. We’re still all smoking, people. Let’s try and focus on giving up our unhealthy, world-destroying habits, instead of worrying about a 2012 heart attack which might never happen. I enjoyed reading the book. It is written in an engaging style, and is argued well. It is full of lateral thinking, and wonderful insights. I commend it as a general text on how to deal with disaster. I’m afraid that I do not endorse its main thrust regarding the return of Planet X. Not for millennia, anyhow, by which time we will all be long gone. But prepared we should be for whatever the Mayans had in mind (perhaps recurrent comet swarms? ), and this book is an excellent, if rather gloomy, focus for that debate.